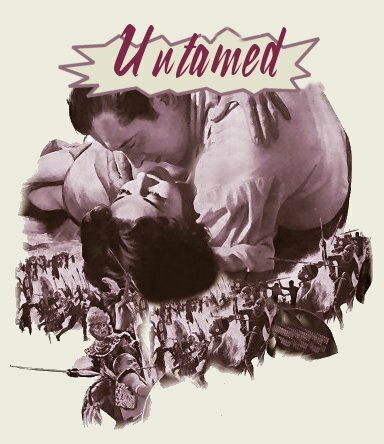 Katie O'Neill (Susan Hayward), a headstrong Irish girl is obsessed with an uncontrollable passion for Paul Van Riebeck (Tyrone Power), a leader of the South African Boers who has come to County Limerick to buy horses. He is responsive but on reflection decides no good will come of it and abruptly leaves to continue the campaign to wrest a Boer Free State from the Zulu guarded hinterlands of Africa. In the year that follows Katie marries Shawn Kildare (John Justin) and when the potato famine strikes, persuades him to heard with her for South Africa. En route their son is born. In Capetown, they are taken under the friendly wing of Tante Marie (Hope Emerson) and told that the great trek for the Hoeffen valley is about to start. When Katie learns Paul is leader of the Commando, she persuades Shawn to join them up. She turns to Aggie (Agnes Moorehead), her woman servant from home, for agreement, but she dourly mutters, "Isn't seeing him what you started out to do?" They are not long on the route before Katie's flamboyant beauty involves her in a romantic situation. The handsome leader of the outriders, Kurt Hout (Richard Egan), is frankly interested in Katie, which stirs up the hatred of his mistress, Julie (Rita Moreno) and adds to the tensions of the too gentle Shawn. The real crisis comes when the small band of settlers are nearly decimated by the fierce Zulu tribes before Paul's group arrives. In the battle Shawn is killed. Paul is astonished to see Katie and greets her as warmly as the circumstances permit. Less circumspect is Kurt, who is an old friend of Paul and makes it clear he intends to have Katie. Now, under the protection of Paul's Commando, the settlers reach Hoeffen Valley without further incident and celebrate their arrival with a ball where Katie unmistakably offers herself to Paul. When Kurt eventually discovers what's happened, he goes for Paul with his long, voortrekker's bullwhip crackling. In a savage battle Paul wins out and he and Katie stake out a homesite. However, not many months pass before Paul is compelled to return to the Commando, leaving Katie in a rage of frustration. Katie has a hard time keeping the homestead from deteriorating, and keeping the impassioned Kurt at bay despite the fact that she is to have Paul's baby. After the birth of her second son, she turns up in Capetown, having shrewdly sold gold and raw diamonds found by natives in the valley. She buys Paul's ancestral home in Capetown, and it is at a ball there that she again encounters him. It is not long before they are at odds again when Paul learns that the young boy is his son, which she has kept from him. Katie's money runs out in boom town conditions, and she heads back for the valley to recoup her losses. In the town of Kolesberg, she again meets Kurt, who has in the interim become an outlaw leader. The drama of the situation is heightened when word comes that Paul and his Commando are on the way to restore order. In an attempt to ambush Paul's troop, Kurt is finally cornered and killed. Now the Free State can become an actuality with Zulus and outlaws under control. Paul suggests that he and Katie re-establish their old homestead in the Hoeffen valley. Katie eagerly accepts since this is what she wanted all the time.